The Nadiadwala's, who migrated to Mumbai from Nadiad, Gujarat, have been in the film industry for three generations, starting with A.K. Nadiadwala followed by Sulieman Nadiadwala. Presently, they are celebrating 60 years of being in the film industry. The first film to be produced under this banner was Inspector(1956) by Abdul Karim Nadiadwala himself. He further went on to produce movies like, Taj Mahal (1963) and Chitralekha (1964). Recently the banner won many accolades for producing Kick featuring Salman Khan and Jacqueline Fernandez that turned out to be one of the highest grosser of Box Office for the year. Apart from Kick, the production house also produced 2 States starring Alia Bhatt and Arjun Kapoor and Highway, starring Alia and RandeepHooda, directed by Imtiaz Ali. Housefull, a comedy film produced by Nadiadwala Grandson starring Akshay Kumar, Deepika Padukone, Ritesh Deshmukh, Lara Dutta Bhupati, Arjun Rampal and Boman Irani won the Stardust Best Comedy Film Award in 2011. Akshay Kumar has also won the award for best actor in a comedy role category. Ritesh Deshmukh also won the best Actor in a supporting role award for the film. ^ "Sajid Nadiadwala: Whenever I have paid well, I have earned also well". The Times of India. 21 November 2014. Retrieved 7 April 2015. ^ "Nadiadwala Grandson Entertainment Private Limited". zaubacorp.com. 29 April 2005. Retrieved 6 April 2015. ^ "Bajrangi Bhaijaan: Coming soon, to a television near you". Indian Express. ^ "Bollywood experiments with animation". Times Of India. ^ Gupta, Priya (18 January 2014). "It's taken time for people to know Salman is a good guy: Sajid Nadiadwala". The Times of India. 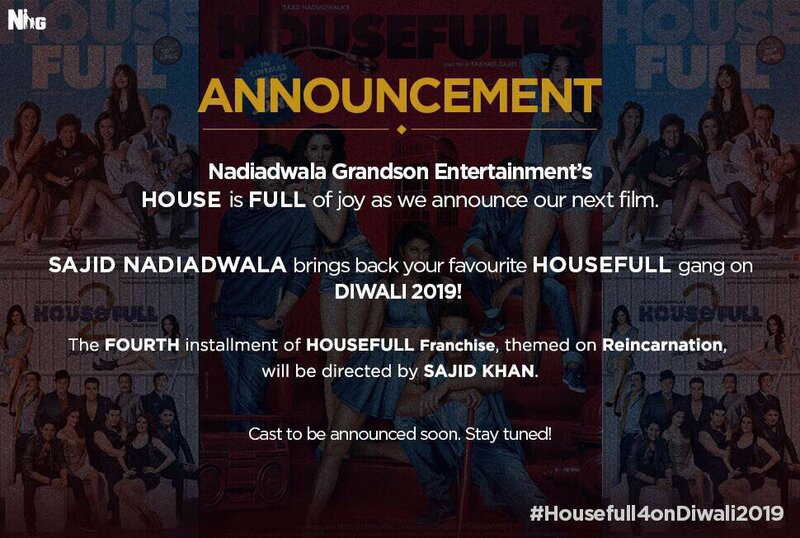 ^ "60 years of Sajid Nadiadwala's - Nadiadwala Grandsons Entertainment Pvt Ltd". The Times of India. 21 November 2014. Retrieved 6 April 2015. ^ "Sajid Nadiadwala". boxofficecapsule.com. Retrieved 6 April 2015. ^ "With Kick, Salman Breaks More Box-Office Records". ndtv.com. 15 August 2014. Retrieved 6 April 2015. ^ "Filmfare Awards 2015: 2 States, Haider Lead Nominations". 20 January 2015. Retrieved 6 April 2015. ^ "'Chhichhore' poster: Sushant Singh Rajput and Shraddha Kapoor's first look from the movie will leave you dumbstruck - Times of India". The Times of India. Retrieved 29 October 2018. ^ "Stardust Award". Retrieved 6 April 2015.